The 2019 Ford Fiesta is a small car that’s big on value. To start with, there’s a wide selection of models ranging from the entry-level S to the generously-equipped SE, both available in stylish sedan and versatile hatch models. And if it’s a more dynamic driving experience you seek, there’s the powerful, sporty Fiesta ST hatch with performance-oriented trim and interior options. The Ford Fiesta is offered with two different engines to suit your style of driving: the responsive 120 horsepower 1.6L Ti-VCT I-4, which is standard in Fiesta S and SE. Standard in the Fiesta ST is a 197-horsepower turbocharged and direct-injected 1.6L Ti-VCT EcoBoost I-4. Many drivers enjoy the control and sporty feel of a manual transmission, and Fiesta satisfies that preference with a five-speed manual in the S, and SE models, while the ST model has a slick shifting six-speed gearbox. For those who prefer an automatic, Fiesta offers the PowerShift six-speed automatic with SelectShift, which is optional in S and SE. In addition to its more powerful engine and six-speed manual transmission, the 2019 Ford Fiesta ST features performance upgrades to the suspension, steering and brakes, plus sport seats, black interior trim, aluminum pedals, black headlamp rims, tall spoiler, special bodywork, and 17-inch alloy wheels. Race-inspired Recaro seats are an option. 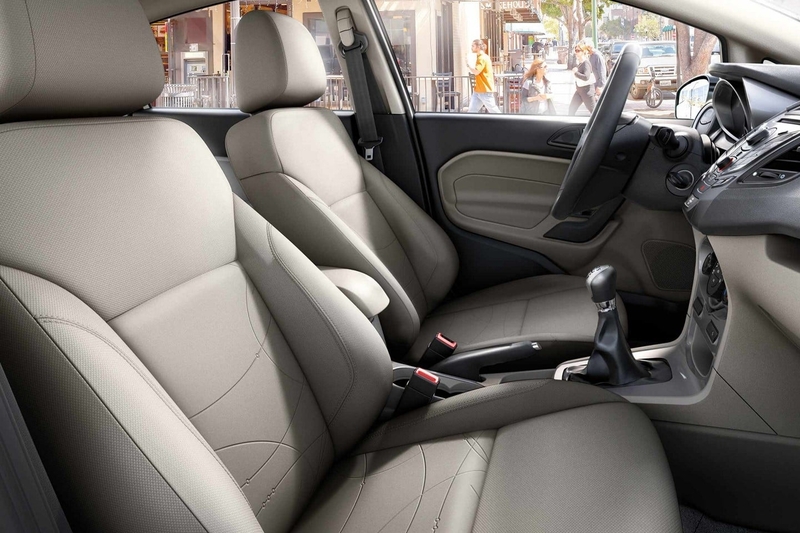 When you open the door to a Fiesta you’re greeted by refined craftsmanship, an easy-to-use center console, soft-touch materials, and available painted metallic accents. To express yourself even further, the Ford Fiesta is available with ambient lighting in the foot wells, cup holders, door release handles, and more. Like all Ford cars, the inside of your Fiesta is filled with savvy tech. Available SYNC 3 offers the latest in voice-activated and touchscreen commands connecting you to people, music, and more. SYNC AppLink with voice control interacts with mobile apps, and connectivity to Apple CarPlay and Android Auto Compatibility are also available with SYNC 3. Utilizing SYNC 3 technology you can change the ambient lighting settings to your desired color, and intensity. Plus the available Navigation System with SiriusXM Traffic and Travel Link. For your enjoyment, premium audio quality comes through clearly courtesy of the available Audio System from Sony with HD Radio Technology. Available also is SiriusXM Radio with over 150 channels, including commercial-free music, sports, talk, and more. Safety features found on every Fiesta include 4-wheel anti-lock brakes, AdvanceTrac stability control, traction control, a rearview camera, and tire pressure monitoring, as well as seven airbags; MyKey parental controls are also available. So regardless if you’re looking for a first car, a comfortable and economical commuter, or a canyon-carving sports hatch, there’s a 2019 Fiesta for you at your Southern California Ford Dealers.